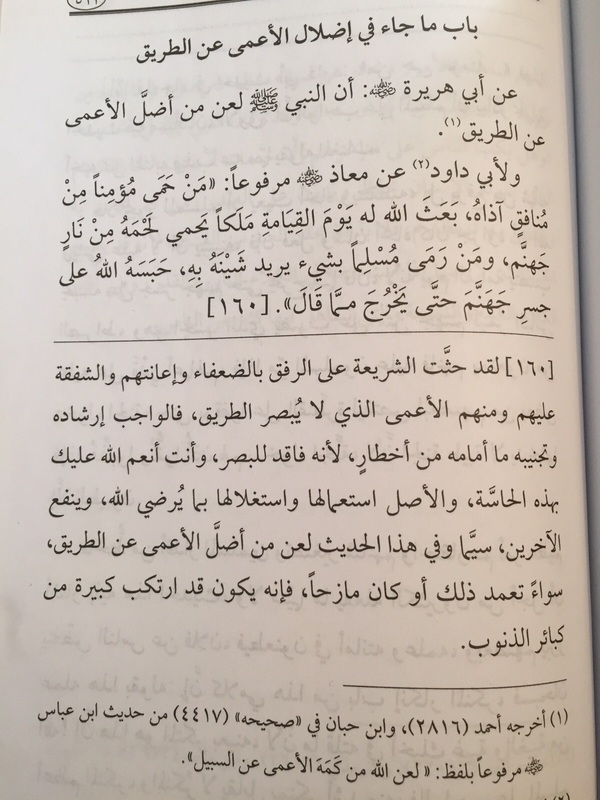 On the authority of Abu Hurayrah (رضي الله عنه) that the Prophet (صلى الله عليه و سلم) cursed the one who misleads the blind person (by sending him in the wrong direction). The sharee`ah (Islamic legislation) has encouraged rifq (gentleness) with the weak, helping them and showing affection to them. From these (weak) is the blind person who can't see the way. The obligation is to guide him and prevent him from the dangers ahead of him, because he has lost his sight. And Allah has blessed you with this sense. Therefore the origin is to utilise and benefit from it (this sense) in that which pleases Allah and benefits the others. Particularly because this narration contains the curse for the one who misleads the blind from the (correct) path. Whether he is doing that on purpose or by joking. For he will have committed a major (sin) from the major sins by doing this! Reported by Ahmed (2816) and Ibn Hibban in his Sahih (4417) from the narration of Ibn Abbas (رضي الله عنهما) in marfu` form with the wording: "May the curse of Allah be upon the one who misleads the blind (person) from the (correct) path." ​​Source: Explanation of the book Al-Kabaa`ir of Shaykh Mohammed bin Abdul-Wahhab, page 523. Click here for a scan of the page.